A change in the wind! Its been a while my friends and I would apologize, but I’m not going to. I will however share some things that have been brewing in the crew of Empiricus. The past six years of my life, have been dedicated to completing a task, most arduous and that task is behind me now. 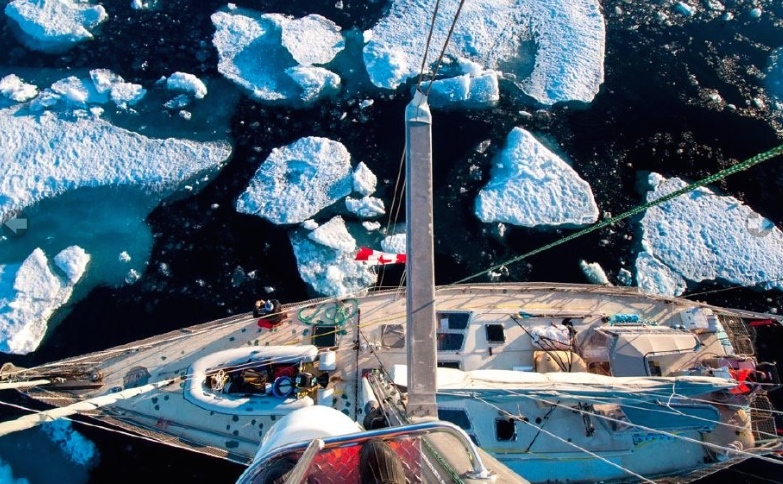 In 2010 when I decided to sail the northwest Passage, I lived alone on my boat, drifting I and out of relationships and spending as much time with my boys as I could, living in a place I did not want to be but making the best of it. Teaching sailing in Alaska for a few months and working construction in the winter wasn’t cutting it financially either. But I had my eye on a rescue plan if you will, for all of us. I was torn between the path ahead and the trail behind as the gap between us grew wider with each season. The decision to complete the voyage, resulted in the most amazing, most rewarding but most financially challenging experience ever. So much was boiling inside me that by the time Samantha and I landed in Greenland, engaged to be married. The boil had reduced to a simmer and my pan was nearly dry. I was out of ideas on how to bring my sons into manhood with a global perspective. As it turns out, the greatest benefactor from the voyage, was me. 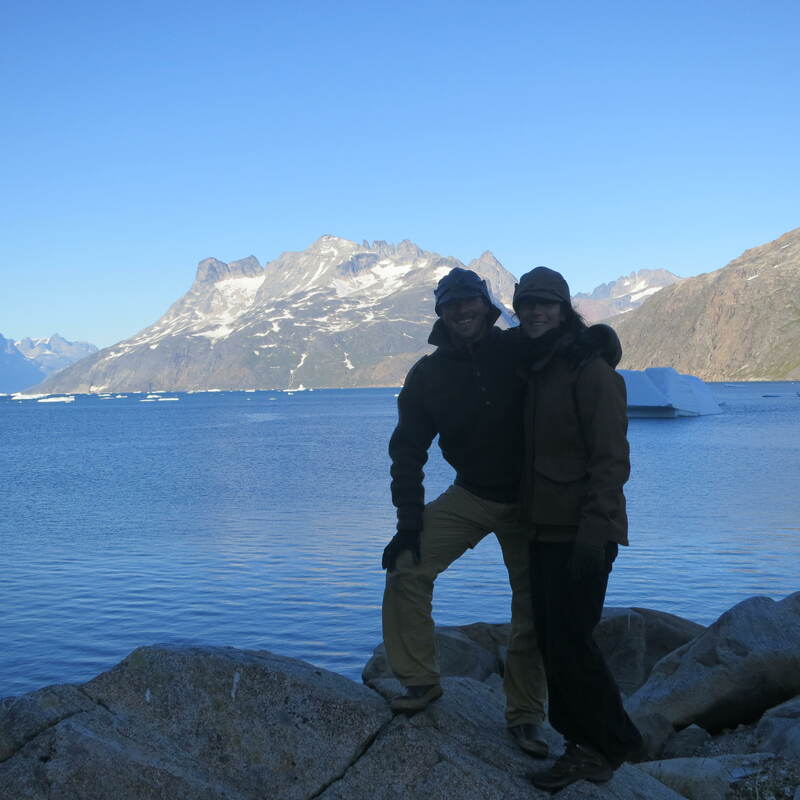 I met my wife in the arctic and pieced my life together with more purpose then I ever had. I also, I yielded to the process of making imperfect choices, day after day after day after day, while still having good intentions and good results. In doing so, I learned, that like navigating in ice, being a father is more about moving in a general direction and controlling damage, then it is plotting an “ideal” course. So how do we move forward? I had already showed them “it” can be done. When I say “it”, I mean anything one sets their mind to. But now what? I had planned to escape over the horizon in 2010 and now Samantha and I as a team are primed and ready for anything! But I am not done being a dad… So after the wedding we flew back to Alaska and moved back to Seward. The same port I had left behind forever…? Oh no… I sank into a funk,taking a job as a fish cannery/ refrigeration engineer, for less money then I made in high school. Slowly we started building our business of watching boats and making repairs building a good, but not quite sufficient client base to continue our circumnavigation. This has been my winters quandary, a twisting message, indiscernible and fruitless. Needless to say, our theme since October has been Hard work and prayer, hard work and prayer, hard work and prayer… Prayer for what? You ask. A magic solution? No. Rather Wisdom Purpose and opportunity… The results of those prayers… Astounding to be sure. So without further delay, Samantha and I are proud to announce the next leg in our ocean journey as well as life. 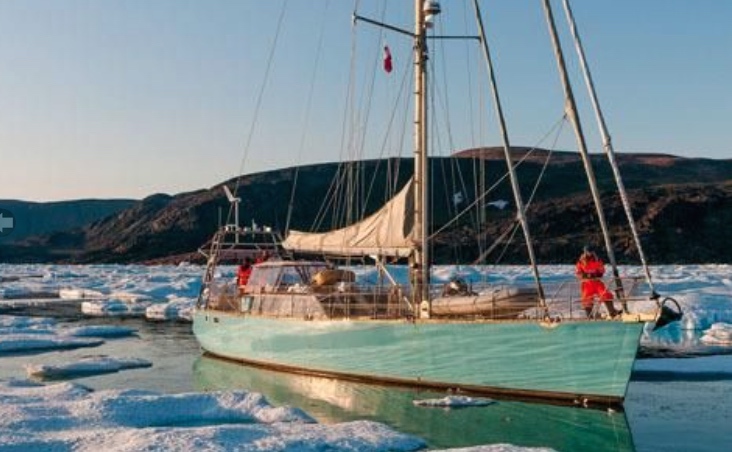 We have secured “Salty” (a 65 foot Bruce Roberts steel hulled cutter, which Transited the Northwest Passage 2014 East to West) as an Alaska based, expedition charter vessel! Salty has a crows nest! The balance has been struck. No longer will we scrape cash for 9 months to sail for 2, while distancing the gap from my sons. No longer will we work, to sail. We will sail for work! 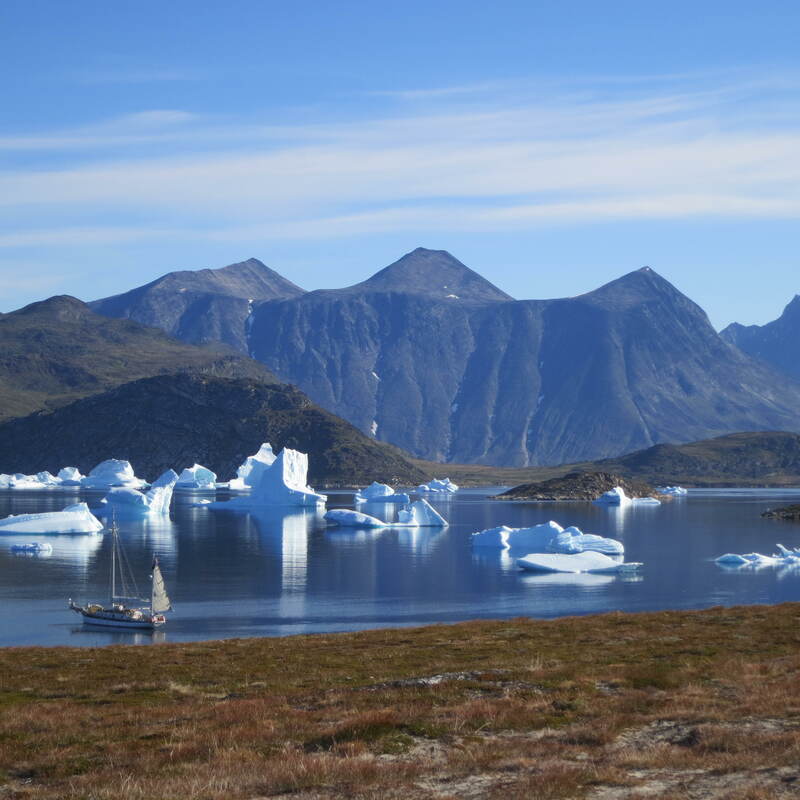 Seven Seas Sailing Logistics begin, EPIC level sailing charters beginning April 1st 2016. So as of this moment, the mighty “EMPIRICUS” is for sale. She has been to me, what the enterprise was to Kirk. She is my blood, but like me, she was made to sail oceans, not sit on the hard. So if you’ve got big plans and moxie that requires a boat with the same, call me. Ive got an arctic equipped ship, waiting for you in Iceland. There is a great work ahead! Oh great! It would be nice to see you guys. Keep us in the loop on your ventures! For sure! I’ll email you. Congratulations. I am so excited for all of you ..!! Happy Sailing ⛵️⛵️. A multitude of mostly, uninhabited cays, pristine whitesand beaches & aquamarine waters … not unlike the Arctic really, except turtles passing by in place of seals; manatee (off Miami) in place of whales, oh!… & the water temperature … in mid 70’s! Photo: Swimming with pigs a Staniel Cay ~ where pigs come out from shore to beg food from passing boaters. Rev. Bob told me of his surprise at finding Empiricus on the hard at Reykjavik when he visited last Autumn. Wonder if you Samantha, found yourself saddle-back since your Arctic return – I recall your penchant for equine ventures. I look forward to meeting up with you seaboard again sometime in the future. Let me know your sail school plans & I’ll spread the word this side of the pond. Thanks Steph its so good to hear from you! I will send the Empiricus info and am glad to meet any buyer in Iceland, to help them prepare. Sounds like your squeezing the joy out of life. Fantastic! That is AMAZING insight and writing Jesse!!! I’m anxious to watch this all unfold! What a cool thing to know you and Samantha. Thanks John. We will see you on the water soon! No matter what you all decide to do, it will no doubt be a success. Best of luck with the new adventure and we will be looking for you out there- can’t miss that big blue crows nest hauler. Hope you find someone to take Empiricus the rest of the way too! GREAT! Looking forward to hearing your plans! We had the honor of meeting you guys at the Annapolis Boat Show when you spoke with Matt Rutherford. I still have your business card on my desk as a reminder that your dreams of sailing can come true. I admire you guys so much and remember you talking about your commitment to your family. Congratulations on finding a way to be a father and as you say, “sail for work”. I am sure this will be a great endeavor and I hope one day in the next three years we can come up and sail with you. Thanks for sharing your story! !